Welcome to the Kenkun Shrine Website! Kenkun Shrine was established in 1869 on order from Emperor Meiji in order to venerate the spirit of Lord Oda Nobunaga. 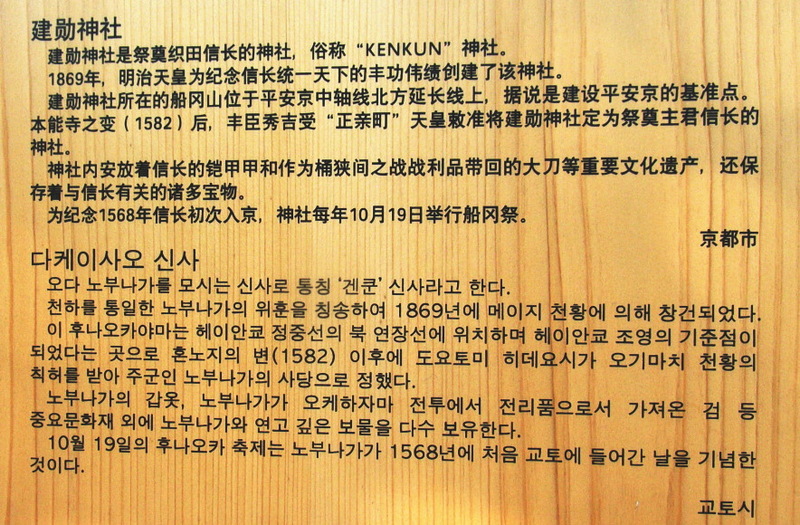 Granted the status of an Imperial Shrine of Special Status in 1875, the shrine then received sacred land on Mt. Funaoka. 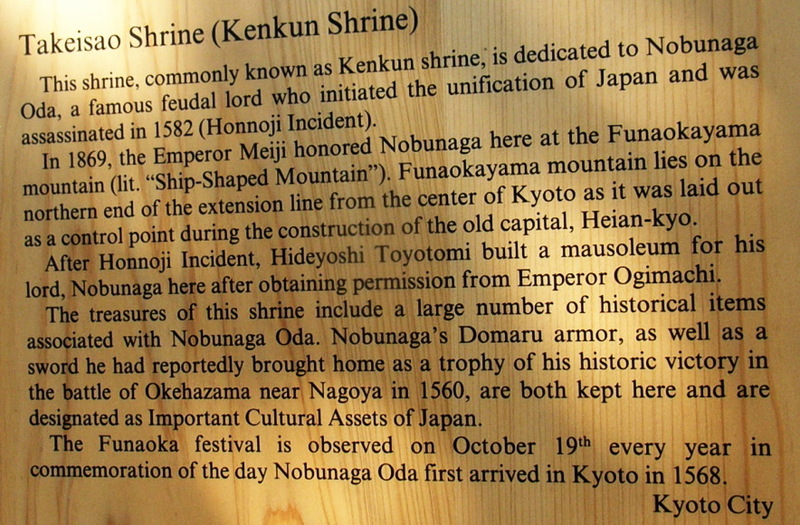 In 1880, ground was broken for the new shrine buildings and Nobunaga’s legitimate son, Nobutada, was also enshrined. In 1910, the shrine halls were officially transfered from the base of the mountain to the main hall at the summit, and it remains there to this day. Mt. Funaoka is a small mountain that was regarded as the place of worship for Genbu of the North, a black tortoise and one of the four god beasts said to guard the cardinal directions around the Heian capital. From the lush grounds of Kenkun Shrine you can see Mt. Hiei and Mt. Daimonji (Mt. Nyoigatake) as well as enjoy the sight of the 36 Peaks of the Higashiyama mountain range in the east. Though formally known as Takeisao Shrine, this shrine is more commonly referred to as Kenkun Shrine, or Kenkun-san. 当ホームページに掲載されている文章及び画像の無断転載はご遠慮下さい。copyright©2012 Kenkun Jinja all rights reserved.